Time To Put Them Away! Time to put you away! I am so glad that this weekend I was able to pull my flip-flops out for one last time this year! 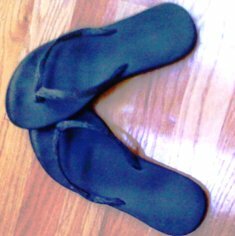 I love wearing my flip-flops and I wore them every place I could all summer – even to church. I know people were looking at me as if I had no other shoes. I do! I love shoes and have a whole closet full of shoes, but there is something about these flip-flops that I love. I believe that it is the freedom I feel when I am wearing my flip-flops. They give me freedom to feel good about who I am and what I am all about. I love to feel free to love, laugh and enjoy my life. Even though I am putting the flip-flops for the winter, only means that the weather is turning too cold to continue to wear them. I am not packing away the feeling of freedom. Even though my feet are stuffed into shoes and boots all winter, my heart is free to love, laugh, and enjoy my life every day with out restrictions. So until next spring, goodbye flip-flops enjoy wintering in my closet. I will think of you often, just know I love how I feel when you are on my feet.